After already beginning on a dark path of Christmas ghost stories before Christmas, we thought we might as well go darker. Nothing says a Christmas-break read more than a macabre tale of cults, fires and mental hospitals. We enjoyed this read, which might be more of a comment on our book club than the book itself…? “Taking the idea of oppression through piety and offering an extreme depiction, After the Fire is full of with visceral descriptions and a harsh setting. It’s not the most cheerful book to end 2018 with, but still a pretty damn good one. It’s straightforward to visualise the world that Will Hill has created, which makes it all the more harrowing, exposing the reader to events that transpired there. With the way the novel is laid out, flashing back and forth between the Base and the rehabilitation centre that the protagonist Moonbeam finds herself in, it’s easy to be a bit disconnected at first. I felt as disassociated as the people in charge of her recovery process at first, but as I slowly began to piece the story together through Moonbeam’s recounting, I got more and more engaged until I outright hated some of the characters for the things they did. It’s easy to make likeable characters; it’s easy to make depressing ones; making hateful characters is much more impressive, and Hill achieves it masterfully. The structure of the story caught me off-guard. It consists of Moonbeam’s interviewers trying to get her to open up about the events before the fire in her home. But I ended up getting into it as time went on, watching Moonbeam slowly recover from what she’d suffered enough to subject both myself and her therapist to it. Some of my favourite moments are when she’s forced to compare her life to the outside world; it adds a terrifying sense of injustice to her story and reveals how far outside the law her world was. One of my main problems with the novel was the number of characters, specifically the ones from the Base. Hill did an excellent job of drawing my attention to the people who matter the most, but it took a while before they started sticking in my head. The first hundred pages or so got a bit confusing for me because of how many people there were. “After The Fire was an excellent light read for over Christmas. Its subject matter wasn’t light but instead the opposite, making it easy to read, engage with, and entertaining all-round. Dystopian style texts are all too familiar these days, and Hill has managed to create a believable world, an enclosed cult existence that could be occurring multiple places around the globe. However, what makes this novel sinister is the parallels it makes to the rest of the world. When Moonbeam first enters the rehabilitation centre, she seems to find striking similarities between the doctors and Father John’s language. Both have told her that the other one is lying to them, that they are oppressive and restricted Moonbeam’s freedom, and while the doctors tell her this about her past cult life she remains locked in her hospital room. It is these clever similarities, with an almost Foucauldian tone, that makes this novel work because we become as doubtful as Moonbeam within our society. “Cults. Their complex internal workings of power and hierarchy. The ability of one or few individuals to condition masses. It’s a topic that fascinates many, including me. This book is one that I was pretty excited about; I have to say. 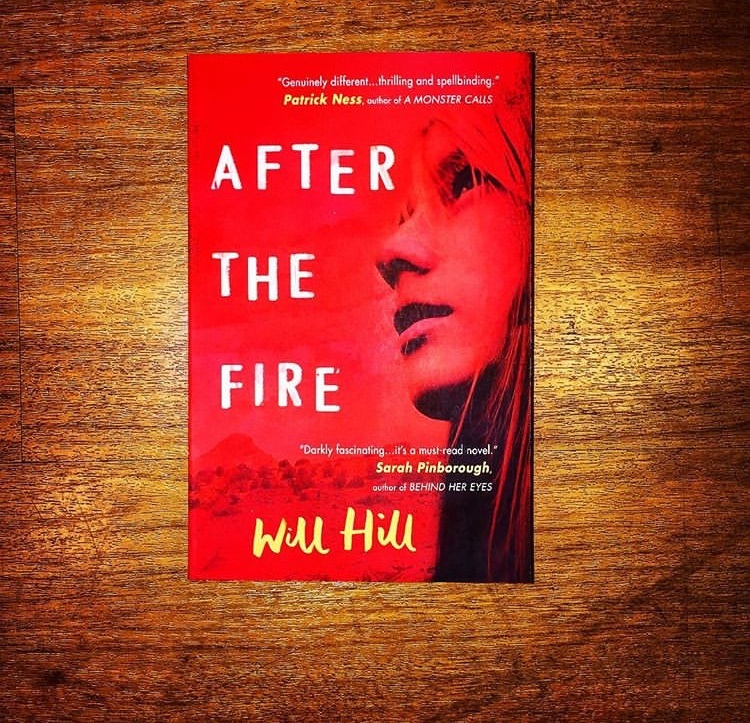 After the Fire is a novel by Will Hill that follows the story of Moonbeam, a survivor of a cult called ‘the Lord’s Legion’. Hill’s interest in the ‘Waco Siege’ inspired this and the effect that this had on the children involved, which he has discussed openly online. This psychological exploration of cult life can is evident throughout the novel, with the story broken into two distinct narratives: ‘before’ and ‘after’ the fire. I appreciated the paralleling of these two parts of Moonbeam’s life; Hill’s entwining of time within the cult alongside the aftermath in the therapist’s chair was a clever way to demonstrate the long-lasting impact of Father John and the religious extremism of the Lord’s Legion. The past and present were shown to co-exist. I also found that Hill segues between ‘before’ and ‘after’ sections of the novel delicately and effectively. There are clear titles to eliminate confusion, and the transitions were subtle. They didn’t feel shoehorned in. I specifically felt that the line “in which case, why don’t you tell me something. […] it doesn’t have to be important, just something about your life”’ from Doctor Hernandez, was a transition with particular power. It demonstrates how normal and everyday life within ‘the fence’ had grown to be. Despite this refined movement between time, and complex exploration of ‘how power and authority are wielded over men and women’, I couldn’t help but feel that the novel was slightly lacking in its narration. It just felt somewhat simplistic and immature. It was basic like it could do with some oomph, something to lift it. It wasn’t bad by any stretch of the imagination, but it was somewhat disappointing compared to the rest of it. The plot and structure were great; the narration was un-satisfyingly average, so this was a particular sore point of mine.